Ah, pomegranates, the fruit of my people! This is my favorite dish on earth. 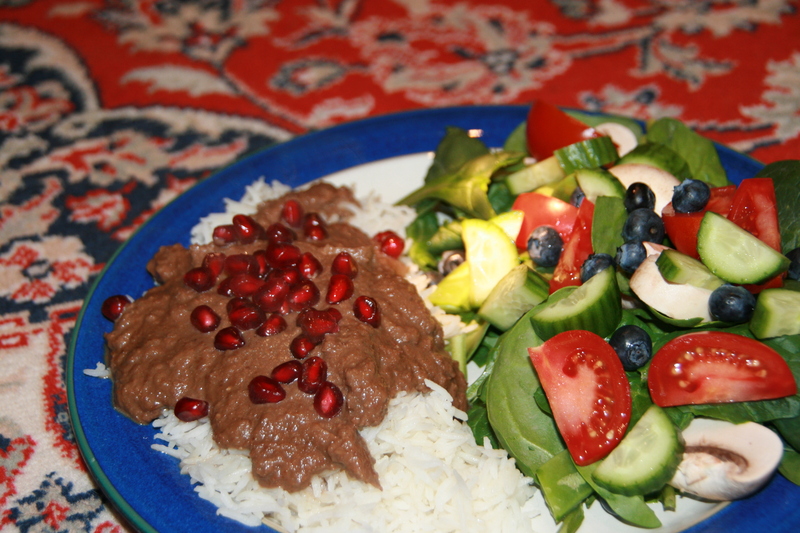 The slightly sharp spike of pomegranates adds a surprising hint of tartness and plush, dark fruit flavor to perfectly offset the richness of the walnuts and onion in this divine sauce, which is ladled over basmati rice (of course cooked the Persian style so that every single grain is a universe unto itself!) When cooled, you can also use it as a dipping sauce for pita bread, which makes a delicious appetizer. You don’t have to have fresh pomegranates to make this dish – all you need is pomegranate juice. 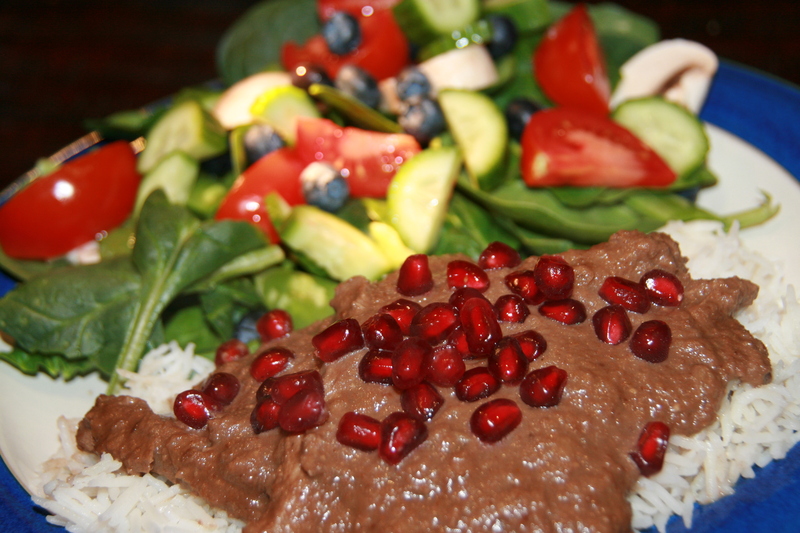 In most Persian households, this dish is typically served with chicken or lamb, which according to my meat-loving husband is perfectly complimented by the deep pomegranate flavor and savory walnuts scented with saffron, but now that he’s making an effort to eat vegan meals, he actually loves it with fake chicken! (Personally, I like it without anything in it, but hey, if Captain Carnivore will eat it with fake chicken, I’m all for adding it). Okay, so confession time: a few weeks ago I made Fesenjun for John with faux chicken and didn’t tell him it was fake meat. He didn’t notice. When I told him later, he didn’t flip out at all (bonus!) Instead, he said: “Makes sense that I didn’t realize it. The sauce is the star of this dish and it can really hide the fake meat well, so no wonder I didn’t miss the real meat with this.” That’s HUGE news for my Operation Carnivore Conversion efforts! If faux chicken in Fesenjun works for the Master of Meats, my bet is that it will work for you (or your meat-loving friends/significant others) as well. 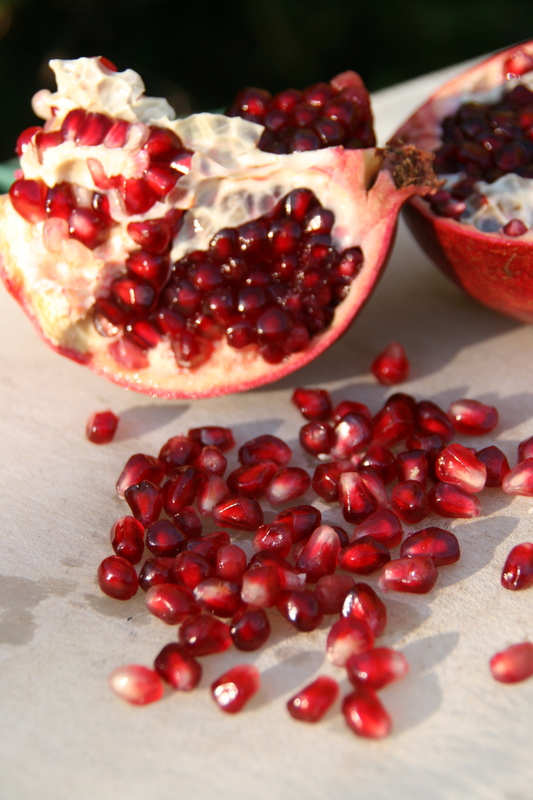 While this dish doe sn’t require fresh pomegranates, it’s a really nice touch to add a few fresh seeds as garnish. In many locations, they’re available well into February, but they usually disappear by March, so if you can, get a pomegranate and try this recipe soon! I want to take a moment to remember and thank my sweet little Persian mother for introducing me to Fesenjun. She didn’t know how to cook when she came to America, which made for some funny and memorable meals when I was young. But after I had my first taste of Fesenjun in a restaurant and literally jumped up and down beside the table, she was determined to try to make it for me at home. And boy was that comical, but I loved helping her in the kitchen! Watching her try (unsuccessfully) to wing it and giggle while removing onion skins from the sauce, I started writing down various attempts including the ingredients and proportions, and then finding and trying various recipes with her. I credit my mother and Fesenjun for sparking the passion for cooking in me, and this recipe is the very first recipe I ever created. Whenever I make this dish, I feel like my mother is in the kitchen with me again and I can hear her bubbly laughter like she were still here, cooking right beside me and feeding me pomegranate seeds while I stir the sauce. As my mother would say, noosh-ee jan! In a food processor, finely grind the walnuts. (If you don’t have a processor, just put the nuts in a blender and add 2 cups of the pomegranate juice and use the “puree” setting to grind up the nuts – the juice will help prevent the nuts from creating walnut paste at the blades.) Add all the pomegranate juice, cinnamon and saffron, and mix until it’s the consistency of a thin, watery smoothy. Set aside. In a large soup pot, heat the oil over medium-high heat. Saute the onions until they’re translucent and just starting to brown. Add the salt and stir well. Add the pomegranate/walnut mixture and stir well. Bring to a gentle boil, then reduce heat to simmer (on my gas range, that’s around #2 on the dial) – it should have a bit of a gentle boil going on. Cover the pot and cook for 1.5 hours. Be sure to stir it every now and then to prevent scorching (which can happen since the nuts settle to the bottom). The sauce will thicken considerably as it cooks. After 1.5 hours, taste-test the sauce. Personally, I love the tartness of the pomegranate, but if it’s too sharp for you, add 1 tablespoon of sugar (or a few drops of the agave sweetener) and stir well. Keep adding sugar/sweetener to taste (but be careful not to overdo it). You’ll be surprised how much the sugar rounds out the flavors! Now take a stick blender and blend it until it’s smooth but still a tiny bit chunky. (If you don’t have a stick blender, you can do this in a regular blender or with a food processor). If using fake chicken, add it now and continue cooking the sauce until the faux chicken is heated through, which should take 1-2 minutes. Serve atop hot rice and sprinkle with fresh pomegranate seeds, which will make your dish beautiful! Noosh-ee-jan! p.s. When you refrigerate the leftovers, Fesenjun makes a delicious dip with pita bread the next day! So you can serve it as dinner one night, and an appetizer the next. Nummy! Ooo this is mouth watering, I shall have to try it! It doesn’t look pretty, but it tastes soooo good. It’s unlike any other food I’ve ever had – it’s got such a unique flavor. I really hope you like it! Please let me know what you think of it when you have a chance to make it – I’d love to hear what you think.